California Livin Home: Small Space, BIG ideas! Have a small house, studio or apartment that you just don't know how to decorate? I have had the same dilemma! Our Condo Loft. One big room downstairs with an open concept (essentially just 4 walls, one mostly glass) and the kitchen. Decorating a Loft or any small space can be fun if you use the right scale furniture and keep it to a minimal. Sectionals work great because essentialy it is one large sofa that will comfortably seat (if you are lucky) 8 people. No need for an accent chair (unless you have the space). Remember, lofts and studios are open concept, which means, no walls or very few. Your dining is open to the living which is open to the kitchen. In lofts you have the bonus of vaulted ceilings. Love um'. 16 foot soaring walls to draw your eye up (which also gives you the illusion of more space!) Art can be massive on these types of walls, and shelving can be placed higher. Open shelf units (like the one above) can separate and define the spaces between living and dining but also keep your eye moving thru the space so it appears larger instead of a solid shelving which will stop the eye and make each area appear smaller. Area rugs can also define a space like this one above does under the small round dining room table. 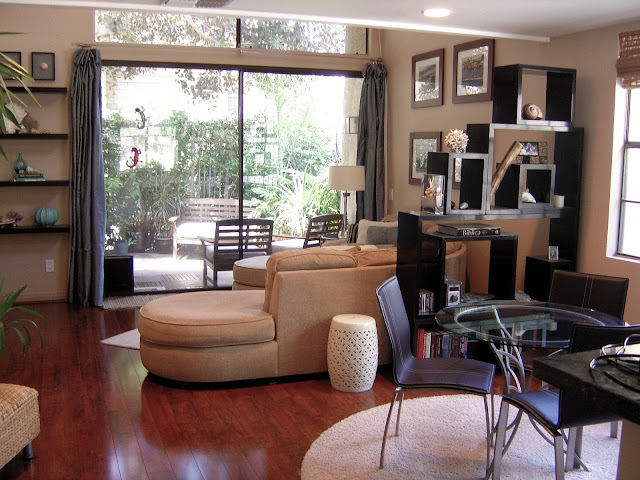 Whether you have hardwood floors or not (area rugs can also be placed on top of low pile carpets. Note, the dining room tables glass top.......in a small space glass top tables work great. 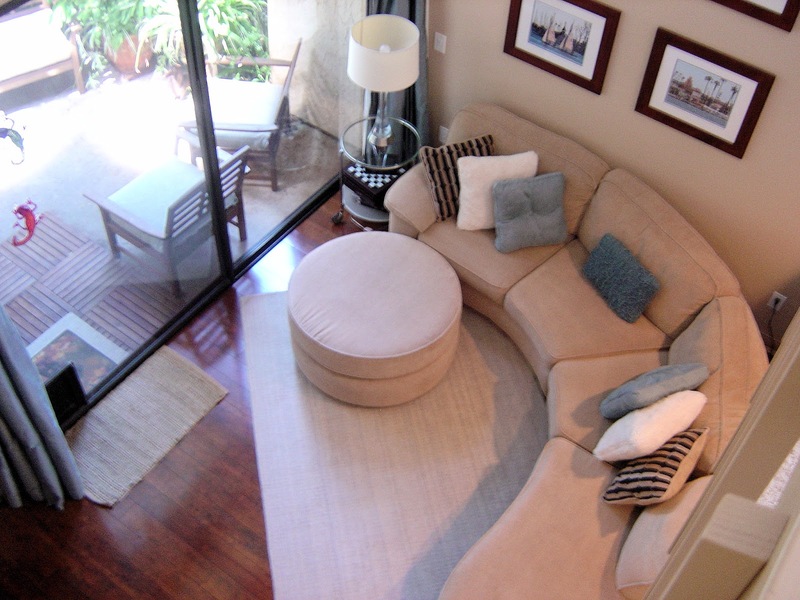 Peering down from the loft bedroom you can see the spaciousness a sectional gives the room without being to cramped. It is one BIG piece not several individual pieces that sometimes make a room seem more like a maze to walk thru. Simple round glass (another clear option) side table with a lamp makes a nice accent. An Outside Patio is a nice bonus space for more entertaining and outdoor furniture if the party overflows from the living area. Whether you live in a small house a studio or a small apartment or loft...great spaces start with great pieces of the right size furniture.